Wayne Mudekwa has sent me a message from beyond the grave. A local contact gave me a package he received a few days ago. My name was on the cover along with a familiar quote from Wayne: “Tears can move mountains”. Months ago I mocked that sentiment in one of my posts. I look back at what I wrote and see a different man. I barely recognize myself. Inside I found several documents and photocopies, bills of lading, long lists of all types of ammunition and small arms. And everything pointed to one man: The Jackal. The APR and the UFLL have been buying their arms and ammunition from the Jackal. He has managed to keep a supply line open to the outside world. The African Union has been trying to shut him down, but he manages to avoid their men and get supplies through the borders. One curious fact mentioned in the documents. Wayne learned that the price for these supplies was well below black market value. This is especially odd given the desperate situation for both factions. No doubt they would have gladly paid any price to be fully armed. The Jackal doesn’t appear to be taking advantage of the opportunity. I’m curious to know your thoughts on this development. Feel free to leave a comment and share your insights. im really pleased to play this game but i want to know who is jackal why still his identification is unknown to african govt. > that feel good, regardless of eye dryness? (Or any being developed)? People I dare say that this is one of the best if not the best game that has come out in recent times, great item excellent blog, thank you people make me very happy! Months ago I mocked that sentiment in one of my posts. I look back at what I wrote and see a different man. I barely recognize myself. the war was real and so was the jackal (i looked it up)u fags. the game is based on real life and u fags writing comments on far cry 2 stop because u r retards and it proberbly pisses off the civilians who were in the country at the time the game is mostly based on real life like the factions and the jackal and the leaders of the factions so if u think it is fake SHUT UP!!!!!!!!!!!!! Reuben is a character from the video-game "Far Cry 2". The conflict in Far Cry 2 is not real, it's not based on a real conflict, the country is fictional as well. When you look a the news, you'd think that it's based on Congo, but it isn't. Orderly, I'll never understand how I managed to miss that, seeing as I study Latin. The port authority stamp appears to say "APR". I wonder whether this refers to the faction or if it is a mere coincidence. Nice blog. I've been following it ever since it's online. My first comment: Profit is not everything when it comes to war. Sometimes there's just war itself. good catch there, sensical. but in my experience in both africa and the middle east (173rd Airborne), women don't usually play a significant role in operations or logistics, unless we're talking a suicide-bomber situation and even that's pretty rare. i'm not saying it's not possible, women can kill as well as men believe me, but it's just not likely. what i find more compelling about that bill is the port officers' name: tsvangirai. now i know i'm more interested in african politics than most people, which is how i found this blog, but if you don't know that's the name of the prospective successor to robert mugabe in zimbabwe's contested election. now i'm not saying that he's involved, but it's a small world and that name can only be so common. maybe mugabe hired the jackal to keep a neighbor in distress (therefore the jackal is getting paid no matter the sales numbers, hence the low prices) or to connect tsvangirai with the shipping of weapons and discredit him and his candidacy in the eyes of the world, or keep that nation from competing for resources...i'm not clear on what country reuben talks about, but it can't be too far from zimbabwe because zimbabwe isn't too far from south africa...it's an interesting possibility. not that zimbabwe is in any position to be conducting covert operations (literally 1000% inflation), but third-party financing of a civil war is a classic move. see u.s. in nicaragua, for one example. Reuben, I found it quite interesting that the name of the ocean vessel "Sea Canis Aureus" in the documents Wayne (may he rest in peace)left for you is actually Latin for Golden Jackal. Have you ever heard of the shipper "United (KBS) Bourning International LTD"? The LTD element of the company title indicates that it is a registered business in the UK. Also, are we to assume from the writing on the bill of lading that this shipment was made on the 2nd of May 1992? It also seems that the affixed label has a filing system reference - have you ever seen such a reference number before? This development is quite exciting in regards to learning more of this enemy of peace. My final question here Reuben is a redirection of Wayne's words - Do you know what to do? In my post just below, I made the amateurish mistake of labeling the Jackal as a "he." Not that there's evidence to the contrary, but keeping the Jackal gender neutral is an important point at this stage. 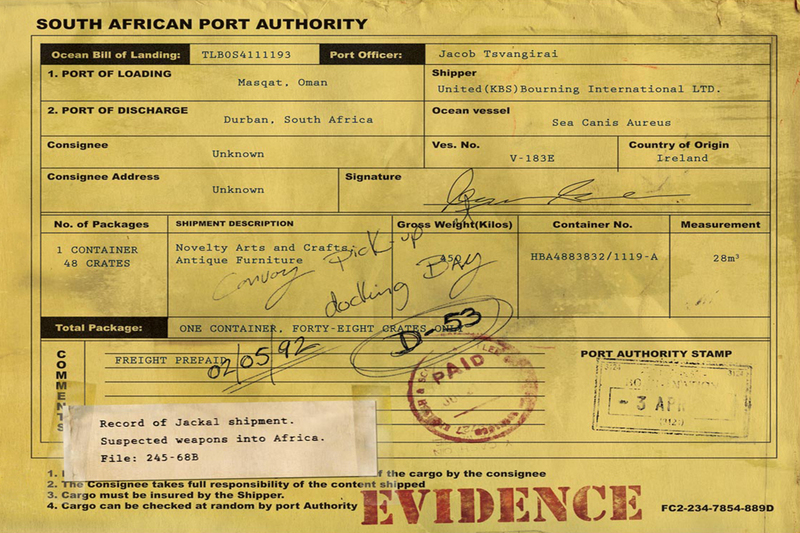 Not that the Jackal is operating under terms established by the World Trade Organization, but he may be simply "dumping" product into the country beneath fair market value because this is far from his only racket (agreed, Issac Silverberg). Predatory pricing aside, the Jackal's actions remind me of Yuri Orlov's sentiments in the film Lord of War: "Without operations like mine it would be impossible for certain countries to conduct a respectable war. I was able to navigate around those inconvenient little arms embargoes." That is the Jackal. The Jackal is a Lord of War. When Silverberg say that maybe the Jackal wants to be a God, I think maybe he rather wants to be the Devil. Cause how can someone watch and help that kind of conflict? Thanks Reuben for exposing this whole situation, although it reallys make me feel bad. I hope someone can put an end to all this! Hope you're well Reuben and keeping safe. By the looks of this, The Jackal isn't in this for monetary gain at all. This is clearly a case of buying influence with goodwill. An "IOU" in other words. I agree with Mr Silverburg. Hes obviously no true arms dealer as he isnt bothered about profit, so what else is their to gain from this country? The country itself? Clearly the Jackal is not concerned about direct profit from his sales to either faction. He must have something else to gain besides money. Perhaps he seeks to gain control of the country after the war is over. Perhaps he does this for his own amusement, to watch the country tear at its own flesh. But I think what he wants is to see his name painted on walls, to see people cringe at the mention of him. I think he wants to be a god.